Last week I bought a one-way plane ticket out of China. I know I made the announcement last October that I would be moving away, but there’s something so FINAL about having paid for a plane ticket, about having a concrete date. About knowing exactly how much time I have left here. I suspect that’s why I put it off so long. I leave in exactly 7 weeks – on Monday afternoon, September 1st. In that time I have to finish sorting and selling 10 years’ worth of belongings. I’m not shipping things to Australia, which means I’m getting rid of almost everything. I’ll leave a few long-term things in storage with a friend, but that’s it. I won’t be going straight to Australia; I’ll be going to Cambodia first. I’ll be working with the international youth in Phnom Penh for four months. I’ve made a LOT of trips there over the past 5 years, so it’s a familiar and comfortable place. I know a lot of very lovely people there, not least of all the awesome kids in the youth group. I am thankful to have a few months of “buffer” between leaving China and arriving in Australia. Both of those things – the leaving and the arriving – will be tumultuous transitions. Having a place in between means time and space to prepare and process it all. I’ll leave you with a photo – one of the last photos I took before arriving in China back in 2004. 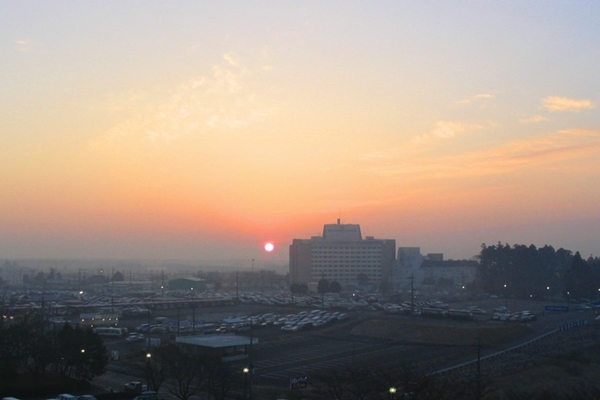 I spent the night at an airport hotel in Narita before the flight across to China, and I took photos of the sunrise that morning from my hotel room. When I took that photo I had no idea what the next ten years would hold. I didn’t even know what the next WEEK would hold! But it all worked out. Looking at this photo comforts me. There is a lot of change in front of me. Sometimes it feels overwhelming – but at least I feel far more prepared (and far less clueless) than the 21 year old who took this photo. Everything worked out for her – and everything will work out for me. And it will all work out in ways I can’t even imagine from my viewpoint here and now.